One of Japan’s biggest pop culture idols for over a decade, Hatune Miku’s synthesised voice and image have been used on hundreds of thousands pop tracks, videos, and franchised products worldwide. Powered by Vocaloid software, she represents the ultimate hyper-idol, a digitally rendered eternal bubblegum teen star. sci-fi vocal-plasty all for just £139.99 (RRP). Perhaps that’s a dichotomy native to the avatar, a figure onto/into which we project ourselves, but also one to manipulate, push around and puppeteer. Complicating this is Miku’s identity (she’s a 16 year old cutesy, sickly-sweet ponytailed girl); how much she’s a reflection of the male gaze, how much of just sincere, juvenile innocence is hard to unravel. It’s simplistic, but Miku means many different things to many different people. It is a fact, though, that Vocaloid software has been particularly fascinating for a splinter group of experimental musicians, and the contributors here are all in some ways attempting to unpick this knotty cultural phenomenon (or at least begin to to describe its nodes). There have been Miku operas made, there have been classical cross-over projects, she has appeared in video installations, but few of these projects have engaged in quite the same way with the intricacies of Miku’s vocal mechanics. open-source freedom what do we pour into those artificial vocal crevices? 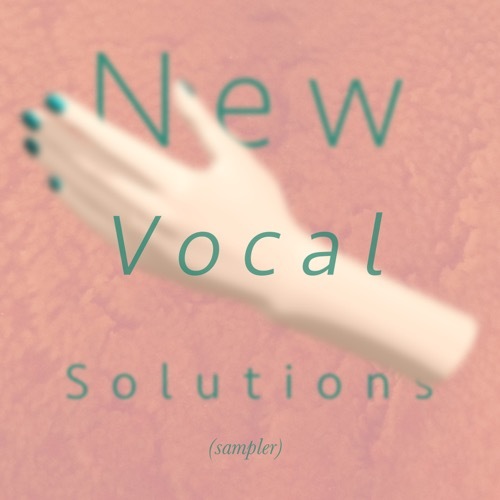 Perhaps one could look at New Vocal Solutions (sampler) as a scout-sub, making a first dip into those exquisitely modelled water-physics – this is what we brought back to dry land.